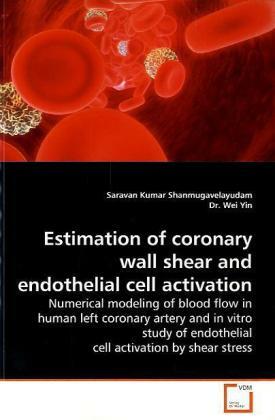 The scope of this study was to estimate the wall shear stress (WSS) distribution inside the human left anterior descending (LAD) coronry artery and understand the behavior of endothelial cells (EC) under these shear levels. 2D and 3D models of LAD under normal and disease conditions (30%, 60% and 80% severity) were discretized and analyzed using CFD (Fluent v6.3.26,Ansys). As the disease severity increased, a disturbed WSS distribution near the throat region was observed. The shear stress history from normal, 80% stenosis and inside the recirculation zone(downstream throat) was exported into a cone and plate hemodynamic cell shearing device. The EC activation due to shear was measured based on the amount of intercellular adhesion molecule-1 (ICAM-1, activation marker) and tissue factor (TF, inflammation marker) expressed on EC surface using immunofluorescence technique. The low oscillating WSS inside the recirculation zone activated the EC and increased the ICAM-1 expression. Meanwhile, the peak WSS at the stenosis throat increased the TF expression. Thus the disturbed wall shear stress near the stenosis throat activates endothelial cells and leads to inflammatory responses.